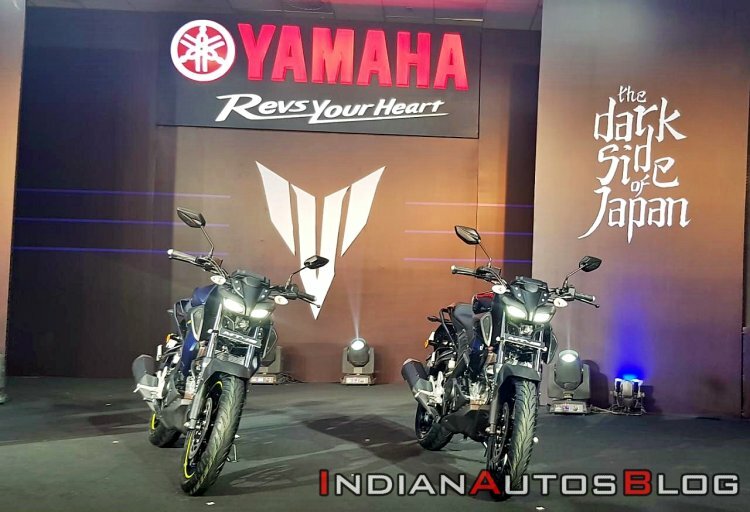 India Yamaha Motor has launched the new MT-15 at an ex-showroom Delhi price tag of INR 1.36 lakh. In comparison, its fully faired version, the YZF-R15 V3.0 ABS, retails for INR 1.39 lakh (ex-showroom Delhi). The Yamaha MT-15 is an ideal motorcycle for people who desire the performance of the Yamaha YZF-R15 V3.0 in a more comfort-friendly package. The bike would compete against the likes of KTM 125 Duke, TVS Apache RTR 200 4V and the Bajaj Pulsar NS200 in the Indian market. The Yamaha MT-15 has been priced at INR 1.36 lakh (ex-showroom Delhi). The India-spec model features revised hardware such as conventional front forks to keep the prices competitive. The bookings for the motorcycle had commenced on March 12, and potential buyers can reserve a unit of the MT-15 for INR 5,000. The booking amount is fully refundable in case of cancellation. The India-spec Yamaha MT-15 is slightly different from the international model, and Yamaha has tweaked the hardware to bring down the cost. Thus, the India-spec MT-15 features conventional telescopic forks instead of upside-down forks, a box-type swingarm with a linkage-type rear mono-shock and alloy wheel design that would be shared with the Yamaha R15 V3.0. The motorcycle would use MRF Zapper tyres. Apart from the changes mentioned, all other styling cues and mechanical specifications have been retained from the international model. Thus, the India-spec MT-15 comes equipped with Deltabox frame, bug-eye shaped LED projector headlight, muscular fuel tank with radiator guards and an MT-09 inspired tail section. The MT-15 would be available in two colour options - Metallic Black and Dark Matt Blue. The safety net on the Yamaha MT-15 includes a single-channel ABS. In contrast, the YZF-R15 V3.0 ABS, which retails for just INR 3,000 more than the MT-15, get a dual-channel ABS. Mechanical specifications are identical to the YZF-R15 V3.0, and the MT-15 uses a 155 cc, SOHC liquid-cooled, 4-valve, fuel-injected engine, with VVA (variable valve actuation) technology. The motor makes 19.1 bhp of maximum power and 14.7 Nm of peak torque and comes mated to an assist-slip clutch equipped six-speed gearbox. Stopping power comes from disc brakes on both ends while the safety net, unlike the YZF-R15 V3.0, includes a single-channel ABS.